1. Turn on your transmitter and switch it to PPM mode. Turn the transmitter off. 2. Turn on the transmitter while holding the F/S button on the transmitter module. Release the button. The RED LED on the transmitter module will flash indicating the transmitter is ready to bind to the receiver. 3. Put V8FR-II into binding mode (see 1.1 Compatibility chart for details) the LED on V8FR-II will flash indicating the binding process is completed. 4. 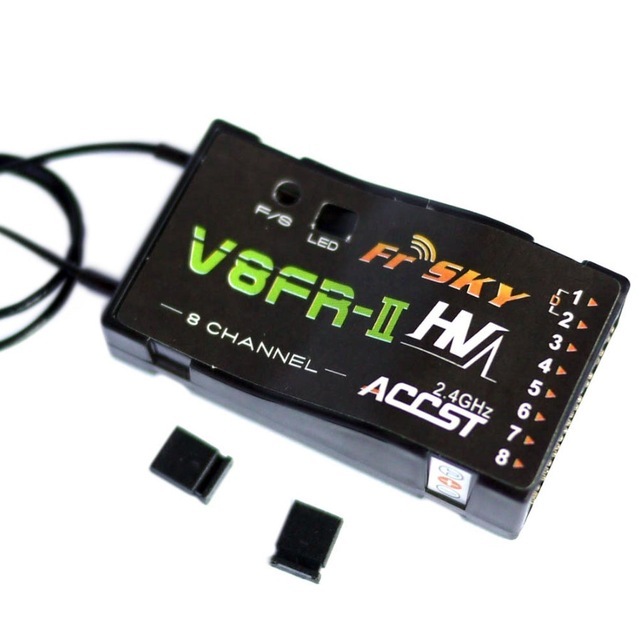 Turn off both the transmitter and V8FR-II (and disconnect the jumper from V8FR-II after binding with telemetry module in D_Mode). 5. Turn on the transmitter and connect the battery to V8FR-II The GREEN LED on the receiver will indicate the receiver is receiving commands. The transmitter module/receiver binding will not have to be repeated unless one of the two is replaced. A pre-flight range check should be done before each flying session. Reflections from nearby metal fences concrete building or trees can cause loss of signal both during range check and during the flight. 1. Place the model at least 60cm (two feet) above non-metal contaminated ground (e.g. on a wooden bench). 2. The receiver antennas should be separated in the model and do not touch the ground. 3. Place the antenna of the transmitter in a vertical position. 4. Turn on the transmitter and the receiver press the F/S button of the transmitter module for 4 seconds to enter range check mode the RED LED of the transmitter module will be off GREEN LED will flash rapidly. The effective distance will be decreased to 1/30 of full range. 5. Walk away from the model while simultaneously operating the controls on the transmitter confirming that all controls operate normally to a distance of at least 30 meters (~30 yds). 6. Press the F/S button of the transmitter module for 1S-4S to exit range check mode RED LED will be back on indicating normal operation is back. Failsafe is a useful feature in which all controls move to a preset position whenever the control signal is lost for a period of time. 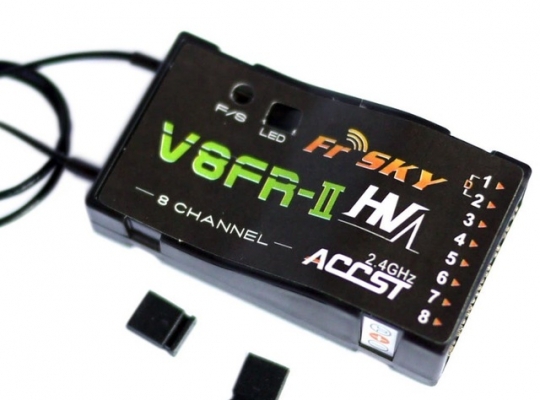 V8FR-II supports failsafe function for all channels. 1. Bind the receiver first and turn on both the transmitter and the receiver. 2. Move the controls to the desired failsafe position for all channels. 3. Press briefly the F/S button on the receiver (less than 1 second). The GREEN LED of the receiver will flash twice indicating the failsafe position has been set in the receiver. To disable the failsafe function just re-bind the receiver.